Wasn’t sure I was going to be able to pull this off, and a couple of entries are definitely trickier than I’d like (I’m looking at you TILDA, LAZAR, and EROS!). I avoided C’s in the fill, which was tougher than I would have guessed, and it’s one of those things that most people won’t even notice. Like pangrams (using every letter of the alphabet), maybe adding unnecessary constraints is just a way constructors amuse/torture themselves. 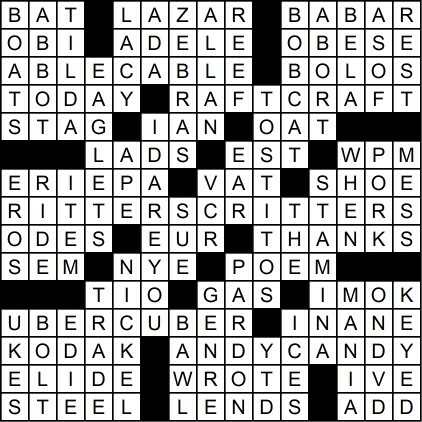 I was happy to get some longer Downs in the grid (IDAREYOU, TOSTITOS, STAMINA, EAGLETS), and had fun recalling my “Fiddler” days with the LAZAR clue. I eased up on the “Oz” clues this week but did get a ref in with the EDIE clue. “I’VE Been Everywhere” is an earworm, so consider yourself warned.